The 1st year of PopUp Providence is underway, and we are now accepting applications for year 2!! In 2013, the Providence Redevelopment Agency dedicated $150,000 for the City’s first tactical urbanism program, PopUp Providence, to be allocated in $50,000 increments over a period of three years. For its inaugural year, the PRA coordinated with the City’s Planning Department and several community organizations to implement a variety of “demonstration” projects. 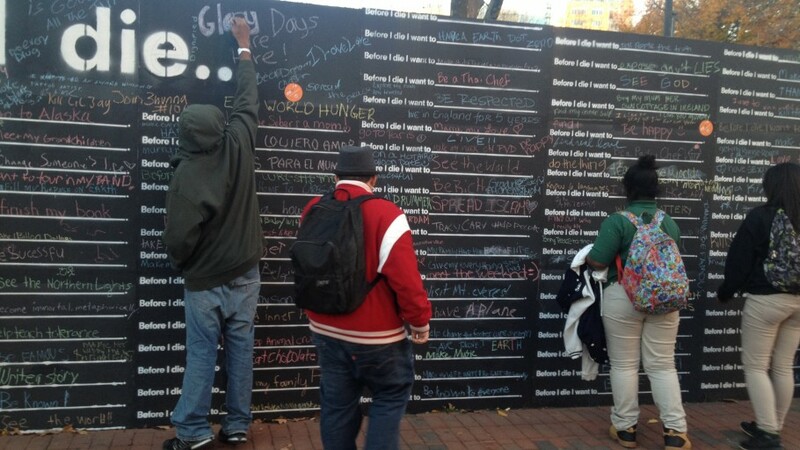 In the fall of 2013, the Planning Department worked with Building Futures to construct and install two chalkboard walls for passers-by to share their wishes for the future. Originally initiated by community artist Candy Chang in 2011, this project has been replicated in 50 countries across the world. Other partners in this effort included Cornish Associates, which maintained the wall in Grant’s Block, and the Downtown Improvement District, which maintained the wall in Burnside Park, both in Downtown Providence. The walls were removed in January 2014 and are scheduled to reappear in different areas of Providence in spring 2014. The Thayer Street District Management Authority, working in partnership with a local architect, will construct and install a ‘parklet’ on Thayer Street in the spring of 2014. The parklet will be accessible to all members of the public, and feature seating, tables and plantings. A parklet repurposes an on-street parking space into a public space for people. It is intended to serve as an aesthetic enhancement to the streetscape, providing an economical solution to the need for increased public open space. The parklet will be maintained by the Thayer Street District Management Authority. In the spring of 2014, two, three-sided, life-size, photo-collage images will be installed in Trinity Square, at the intersection of Elmwood Avenue and Broad Street. Designed by AS220’s youth arts program, in coordination with residents of the Rhode Island Training School, the collages feature the cultural heritage and diversity of the program participants, as well as that of the Capital City. The life-size figures will provide wayfinding for the intersection, as well as complement the work that the City and RIPTA have been doing for the new Rapid Bus transit line. In the fall of 2013, the Olneyville Housing Corporation installed construction banners at two, gateway locations in Olneyville Square. The 120 foot-long banners were perforated in 30-foot increments to allow the banners to be reused for future construction projects. Designed by local graphic artist, Lisa Carnvale, the Square One logo emblazoned on the banners signifies the initiative spearheaded by OHC to brand, market, organize and strengthen the Olneyville Square neighborhood commercial district. In the spring and summer of 2014, Community MusicWorks will sponsor free music events in vacant storefronts in the city. Three, smaller projects, organized by the Planning Department, will be installed in spring 2014, and include outdoor, waterfront, Adirondack chair seating along the East Riverwalk; an outdoor ping-pong table for seasonal public use in the plaza at 444 Westminster Street; and ‘Walk Providence’ wayfinding signs that feature hidden, local landmarks and encourage walking and exploring.